Milan Kohout: 1999, NOVEMBER, Czech Republic, "The Racist Wall will cut your Flag"
1999, NOVEMBER, Czech Republic, "The Racist Wall will cut your Flag"
NOVEMBER.17.1999, USTI NAD LABEM, CZECH REPUBLIC, PUBLIC PERFORMANCE AS A CULMINATION OF PROTEST ACTIONS AGAINST XENOPHOBIA AND RACISM. IT TOOK PLACE NEXT TO A WALL WHICH WAS BUILT TO SEPARATE ROMA AND WHITE CZECH COMMUNITY ....."IF YOU BUILD A WALL YOU HAVE TO DIVIDE YOUR FLAG"
Supported by a grant from the branch of the Cultural Ministry in my birthplace Pilsen, I addressed the issues of xenophobia and racism in my homeland through performance art. I was fulfilling a proposal for a traveling program to the small towns of the region to address these issues. I wanted to investigate the reasons and roots of xenophobic feelings that even I personally brought with me to the United States a decade earlier. I searched, with the help of the audience, to find out why I immigrated to the US with that "package on my back." Organizing several performances in small towns, I arranged "meetings" with the predominantly white-Czech audience seated in a circle around me. I addressed these issues first by emphasizing how a lack of contact and experiences with another group can lead to racism. The overwhelming response from the audience was that they were not racists and that these issues were not a problem. I demonstrated my point using the unfamiliar form of performance art to bring the audience face-to-face with various cultural differences. I drew parallels between the discomfort the audience felt with the unfamiliar art form and their lack of experience with the Romani-Czechs. In one performance, I exemplified the misunderstanding of cultural differences by considering varying conceptions of time, which I had experienced upon immigrating to the United States and also when helping to resettle refugees from all over the world once they were in the US. The Romani-Czechs, for example, conduct their lives with a different sense of time than the white-Czechs, which can lead to a ripple effect of misunderstandings that grow and change, resulting in larger problems. 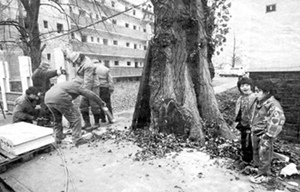 One of the planned performances took place next to an infamous outdoor wall, which was raised October 13, 1999 in Usti nad Labem, and intended to separate the Romani-Czech community from the white-Czech community in that town. On November 17, the 10th anniversary of the Velvet Revolution which ?supposedly? established a democratic society as the Czech Republic, the nation was focused on the celebration of this anniversary. The media awaited a counter-action to the commemoration, for which I was prepared. 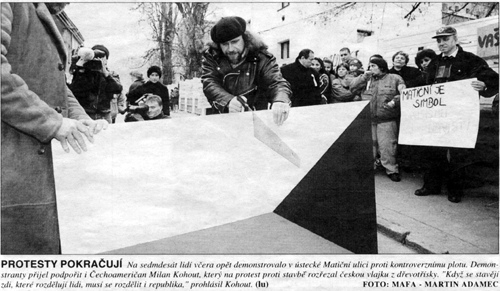 Helped by my friend Vladimir Libal, we painted a Czech flag on a large piece of plywood. Placing it next to the wall, I sawed the flag in half. We then placed one piece on each side of the wall to symbolize the divisions in Czech society, as represented by the wall. That evening, all the Czech TV stations and some world media outlets (including the BBC and CNN), reported news of the perfromance. On the next day, the event received front-page coverage in the main daily newspapers throughout the country. Because of the media response, this performance became the last "hit" in the culmination of protests concerning this issue, which forced the embarrassed city officials to raze the wall several days later. I believe the atmosphere that surrounded me on that day to be similar to the mind-set at the beginning of the civil rights movement in the U.S.